The more things change, the more things stay the same. Stop me if this sounds familiar: the Miami Heat win an NBA championship and LeBron James wins the Finals MVP. Last year, LeBron won his first title and a Finals MVP; this year, LeBron James has done the same thing for the second year in a row. 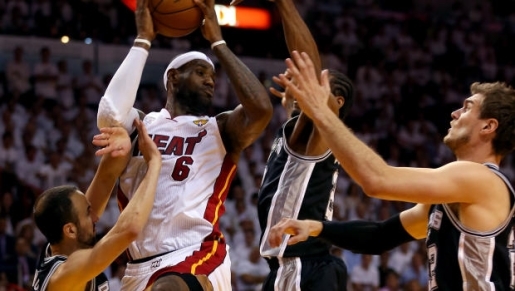 The Miami Heat beat the San Antonio Spurs 95-88. That’s three Finals appearances in a row for the Heat, and two wins. Once again, King James led the way for the team, with an impressive 37 points and 12 rebounds. With 90 seconds left, the game was 90-88, and from there the Spurs had to foul to save time and the Heat sank free-throws to put the game away. It’s San Antonio’s first Finals loss in 5 appearances, but it was a series for the ages.